Singapore loves to light up our streets during festivals and during this Muslim holy month of Ramadan, a long stretch of road a little East from the city centre is as bright as ever with over 2 kilometres of 12-metre high light installations. Not only do throngs of locals come here for the night lights, they love the over 800 bazaar stalls selling everything from Malay traditional clothing, fragrances, home decorations (table runners, cushion covers, curtains, carpets) & the street food! Geylang Serai was one of Singapore’s oldest Malay settlements. The word Serai is Malay for lemongrass and Geylang or “Kilang” is Malay for factory or mill and there were extensive cultivation & growth of lemongrass plants in this area. 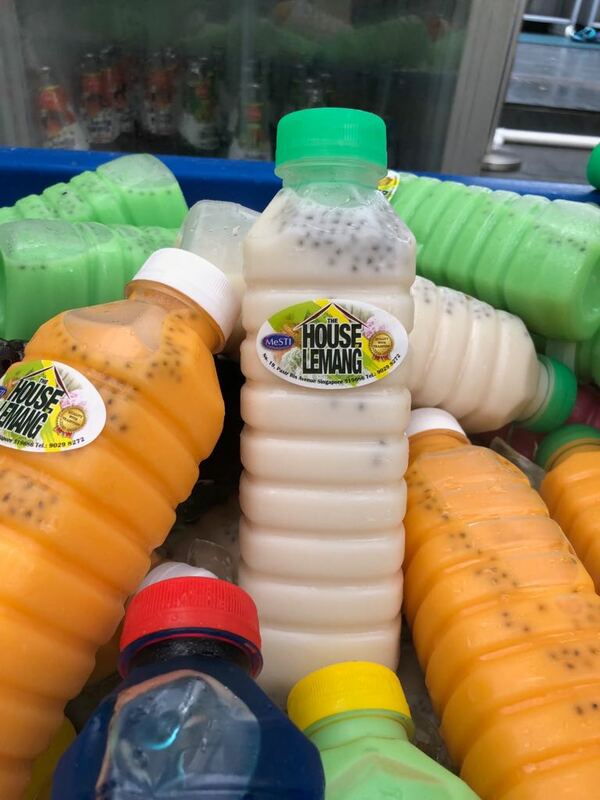 Invented and produced in Malaysia and available as a street food throughout Malaysia, but only sold here during bazaars. The frozen chicken and beef patties are grilled on the spot, with loads of margarine (not oil! ), and drizzled with Worchester sauce, mayonnaise, tomato and Chili sauce, chilli powder and wrapped in omelette. Then the omelette wrapped meat patties are sandwiched between well margarined grilled buns and strips of lettuce. Heaven! All these young local food entrepreneurs always come up with new and creative eats during Bazaars. These chicken or beef meatballs in a bucket looks so tempting and irresistible! They will pile the meatballs above curly fries or mashed potatoes and drizzle hot nacho cheese on top! There is another version where rice cakes are topped with the meatballs and peanut gravy - like the famous Satay (marinated meat on skewers). They have buckets full of juice too with little mango pearls. The portions are just huge! Yeah they gave us a little “flaming” session before handing us an essentially purple coloured vanilla ice cream on top of whipped cream, fruity pebbles and topped with fancy marshmallows. Fancy to look at but not worth the calories. Had this before and I still love it! Essentially gigantic strawberry cornflakes “rinsed” in liquid nitrogen and looking like a erupting volcanic mount! I just loved blowing out smoke after I put one in my mouth! Non-smokers like me gets a real kick out of this! Liquid nitrogen turns into gas very fast at room temperature so yeah it is safe! Always wanted to sound like a chipmunk and I wish I could speak with the “helium voice” a little longer than 10 seconds! A Michelin 3-star restaurant chef in Chicago invented this and now we can experience it! This yummy drink is made with Tragacanth Gum, Malva Nuts, Basil Seeds, Evaporated Milk & sugar. Commonly only available during the Ramadan, boy am I am going to miss this after June! I am going to make another trip just to eat the other foods I did not get to try. Tip of the day : go during weekday nights instead of the jam packed body-to-body weekends! The bazaar is on till 14th June, a day before Hari Raya Puasa and the lights stay on till 30th June. Watch me eat my way through the Bazaar in my video below!